-- Dr. Mike clarifies the Facts VS Fiction about Stem Cell Therapy for both Animals and Humans. talent network, inc. entertainment agency presents "talent talks" Insights, Tips & Discussions with entertainment and media industry professionals. 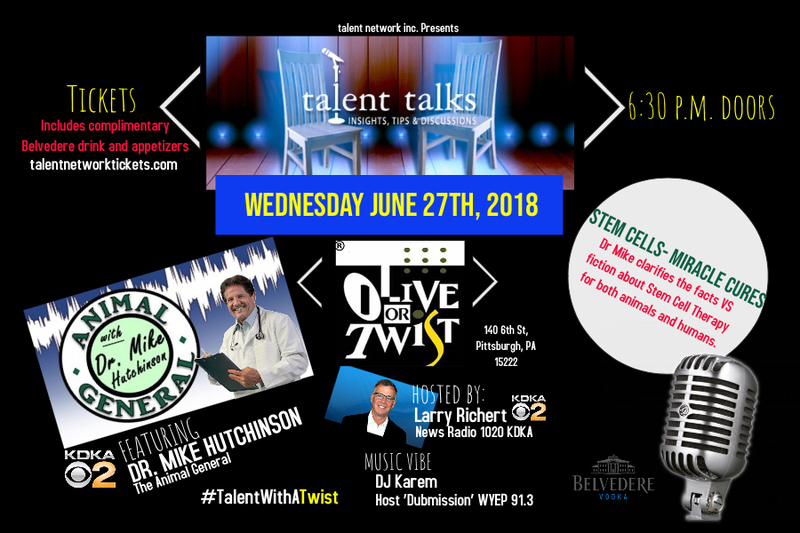 Live from 'Olive or Twist' upstairs Martini Lounge in downtown Pittsburgh, PA. The first talk in the series features Dr. Mike Hutchinson, Doctor of Veterinary Medicine and Leader in Stem Cell Technology. Dr. Mike is the owner of Animal General of Cranberry, PA (Emergency and Specialty Vet Care and Services) and regularly featured guest on KDKA Radio & TV. 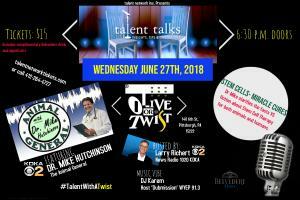 - Taking place in the quaint and cozy Martini Lounge, the doors open at 6:30 pm and the talk will commence around 7:15 pm. Tickets are $15 and include 1 complimentary Belvedere Vodka Drink and light appetizers. There will be a brief Q&A after the talk. As Dr. Mike says, Don't just "Live and Let Live" but "Live and Help Live"